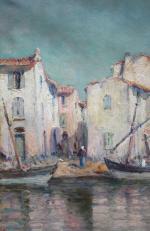 Post-Impressionist view of port of Martiques in the south of France was executed on the turn of 20th Century by good listed French painter Charles Malfroy (1862 - 1918), a native of Lyon, specialized in views of the Mediterranean harbors, and one of Martigues in particular, he liked to paint along its banks. 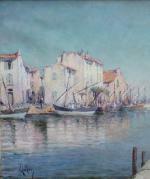 Martigues, known as the “Venice of Provence”, located on the edge of the Etang de Berre and Caronte Canal, which connects the lake to the Mediterranean, and especially its port then inspired many artists in the mid-nineteenth century, such Raymond_Allègre (1857-1933), Henri Théophile Decanis (1847-1917) and of course Felix Ziem (1821-1911) who established there his workshop. Charles Malfroy himself settled in Martigues his studio, which was taken in the first half of the twentieth century by his son Henry Malfroy. 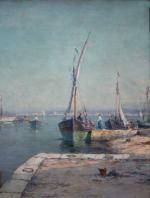 As a follower of the post-impressionist artist Jean-Baptiste Olive (1848-1936), a maritime landscape painter from Marseille, Charles Malfroy was much appreciated for his clear tones and his ability to deal with the Mediterranean light, subtly transposing on his palette the sky and the sea. From Le Havre to Venice, he painted tirelessly in an almost unreal clarity atmospheric effects arising from the merging of these elements. Literature: "General Artist´s Lexicon " by Thieme/Becker and Benezit. "Dictionary of painters, sculptors, decorators and etchers"(in French), Paris, 1999. Technique: oil on canvas. Luxuriousy original antique frame. Measurements: unframed w 36 1/2" x h 23 7/8 " (92,5 x 60,5 cm), w 42 7/8" x h 30 1/2" (109 x 77,5 cm).